This richly clad girl, her clothes sewn with hundreds of pearls, is probably the exiled Dorothea, eldest daughter of King Christian II of Denmark, who was deposed in 1523. In her left hand she holds, upside down, a small armillary sphere. The hoops indicate the motions of the heavenly bodies. The latitude the girl is indicating is very close to that of Copenhagen: the sphere may be upside down in allusion to her father’s lost kingdoms. She is placed in front of a painted frame, a device Gossaert often used in his portraits to give the illusion that his subjects are real rather than painted. So the armilar sphere can be a propagandistic object which was put in her hands to claim for the political troubles of her family. Nicholas Kratzer was born in Munich and arrived in England in 1516. He became member of the scientific circle around Sir Thomas More (1478-1535) from tutoring More’s children in astronomy and mathematics. After being introduced at Henry VIII’s court (Kratzer was appointed the royal astronomer in 1520), he became friend of important painters as Hans Holbein the Younger and Albrecht Dürer. 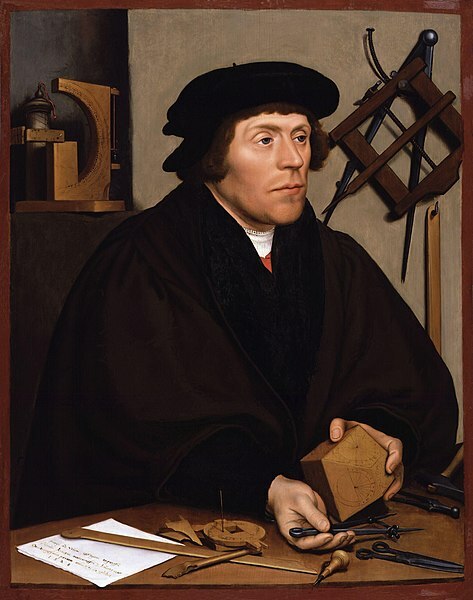 In this portrait painted by Holbein, he is surrounded by some astronomical instruments as a sundial or a quadrant and we can see how Kratzer was engraving a polyhedrical sundial. Here we have the representation of two traders counting coins with a balance above them. This is a little picture that you can find in the building located in Nygade Street nr 1 in Copenhagen. In the Jorcks Passage in the centre of Copenhagen there are some allegorical representations which are difficult t distinguish. One of them is a woman with a plan of a big house and a compass in the other. Is she the allegorical representation of the Architecture? Whatever there is a very interesting shop in one of the corners dedicated to games where it’s possible to find dice, Rubbik cubes, etc. Denmark and Sweden have been two expensive countries for my students. So in our first day in Copenhagen we had to manage for finding a cheap restaurant to have lunch… and we got it! We noticed it in an advertisement and we decided to try it. The restaurant was the Greek restaurant called Samos located in Skindergade 29. The restaurant was very homely and the food is so good. The buffet costed 49 DKR plus the beverages. I think that I will come back if I visit Copenhagen again but not only for its nice Greek food. There is a representation of Pythagoras in the napkins! So if you want to eat Greek food being observed by Pythagoras you must try the restaurant Samos in Copenhagen! When I talked about the Round Tower I forgot to mention that there is a bust of Tycho Brahe next to it! Tycho Brahe lived in the second half of the sixteenth century, during he era known as the Renaissance He was born into one of the most powerful families of the Danish kingdom, and he received the thorough education of a young nobleman at different German universities. His lefelong passion was astronomy. During his lifetime the great topic of discussion was which world system is correct. Is it the earth or the sun that is motionless at the centre of the universe? Tycho Brahe doubted that it could be the sun. But he resolutely affirmed that the answer had to be sought in careful observations of the positions and movements of the heavenly bodies. During his years on Ven he methodically charted the heavens with the aid of advanced instruments. His findings paved the way for a new scientific world-view. Tycho’s life was chequered and dramatic. During his time here on the island, Ven became a brilliant centre of European science. He was unconventional in his lifestyle and had a view of women’s ability that was unusual for the time. He was an all-rounder science, with a great talent for organization. Here he shaped the kingdom of Urania. Welcome to the Tycho Brahe Museum! When taking measures, the quadrant was turned until it pointed towards the star. The ruler with the sight was then moved along the arc until the star was visible in the sight. The altitude of the star was read off on the scale on the arc and the direction of the star was read off on the circular scale running round the room. So the sextant was used to measure the angular distance between stars (the stellar distance). Tycho called his castle Uraniborg after the Greek goddess of astronomy, Urania. The building was purposefully deseigned in the service of science, and it was Europe’s first astronomical observatory. Another of the instruments which Tycho built for his Urania was the Quadrans MAgnus Chalibeus (1588) with which it was possible to measure altitudes and the azimuth of any star. 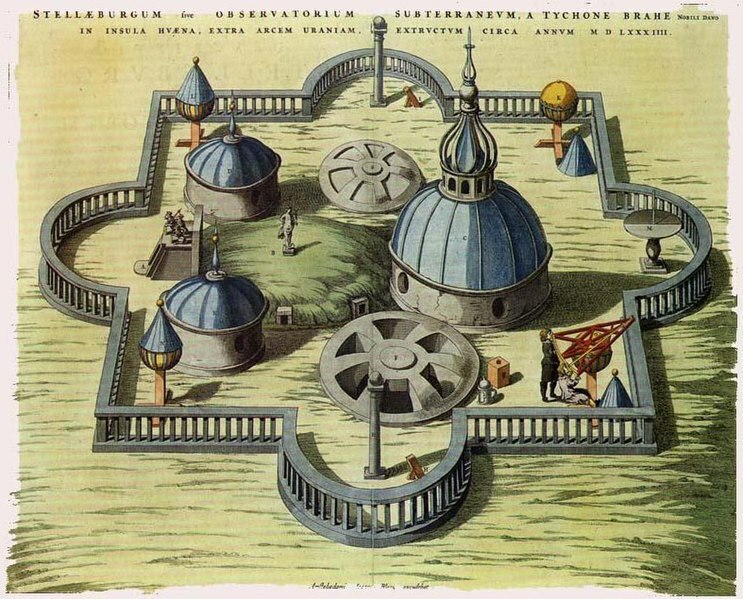 Tycho’s achievements as an astronomer were pioneering. He sought to re-establish the high science of classical times through meticulous and direct observations of the heavenly bodies. For several decades he surveyed the heavens with the aid of advanced instruments. His measurements were unique in their accuracy, and would not be surpassed for almost three centuries. The current reconstruction of this space takes you back to times of Tycho because you can listen a recreation of one of Tycho’s nights. There are the astronomical instruments placed in the same place as four centuries ago and all the show has been thought to wrap the visitor in this scientific moment. Brahe’s astronomical instrument in Stjerneborg. Here he got the best series of observations and astronomical data than any other scientist in those times. And… that’s all folks. If you visit Malmö or Copenhagen, this is one of the most scientific trips that you must do! This building is full of crystal squares and it’s located in the Rådhuspladsen of Copenhagen, next to Tivoli gardens. I think that I’m going to take a coffee (a double espresso with cold milk) here! The planetarium in the Round Tower is a three-dimensional model of the solar System with the Sun at the centre, orbited by the six innermost planets. Copied from Bayer’s early 17th-century work, the background depicts the starry sky of the North. It was mounted in 1928 as a replacement for the original 1740 model. The original planetarium showed both the Copernican system, with the Earth orbiting around the Sun, and Tycho Brahe’s divergent system, with the Earth at its centre. 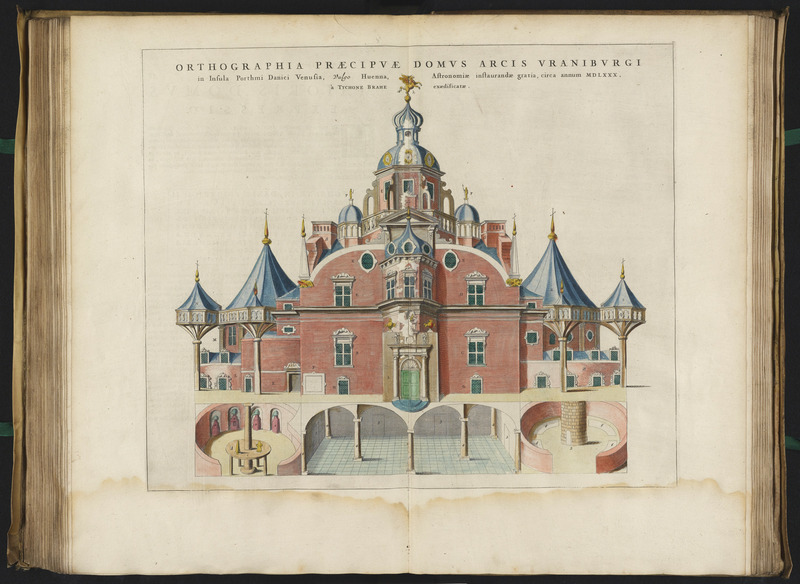 The Planetarium was not installed until 1697, but it was built by Ole Romer, astronomy professor and head of the Round Tower observatory, as early as the 1670s.